These are the same to me. I’ve hidden this secret for years, and it’s time to face the truth: Most of the time, I can’t open twist-off bottles without the aid of a bottle opener. Yes. This is a fact. Just today at lunch I labored over a bottle for several seconds, even considering breaking it on the edge of the table and drinking out of sharp glass, before handing it to a female friend with bad circulation in her tiny hands…who promptly opened the bottle with ease. If I were a supervillain, this would be my greatest weakness. Well, this and kittens. Especially if those kittens were in a container with a twist-off cap! I admit this weakness with much chagrin, because in all honesty, I think the twist-off bottle cap is one of the greatest innovations of our generation. I’m surprised normal bottle caps aren’t obsolete by now. Perhaps that’s a blessing in disguise, because without normal bottle caps there wouldn’t be bottle openers, and without them I wouldn’t have a way to open twist-off bottle caps when no one is looking. It feels good to get this off my chest. Surely you have something like this too, some odd, niche weakness that doesn’t make any sense. Feel free to share in the comments. This entry was posted on Wednesday, June 18th, 2014 at 11:14 pm	and is filed under confessions and tagged with confessions. You can follow any responses to this entry through the RSS 2.0 feed. When I worked as a bartender I’d show off by opening six bottles in a row on my then using a wrist-flick to toss the caps into the trash. You need taut forearms (do lots of bench dips – http://www.burnthefatinnercircle.com/members/Bench-Dips.cfm) and strong skin (lots of lotion) to keep from leaving permanent marks. And a lull in the game on TV to keep your patrons’ attention. 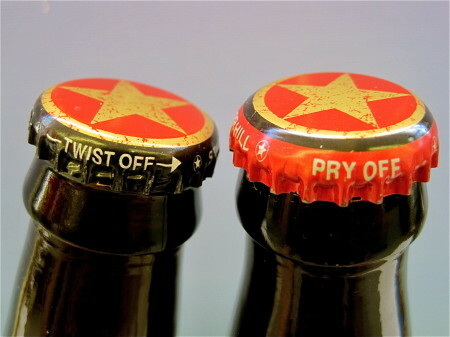 So there’s this detente between pry-cap and twist-off beer drinkers, with some liking the convenience of the twist off and others saying it’s not a real beer unless you need a “church key” to open it. I was on a tour of the Boulevard Brewery back in 2001 and asked the tour organizer why the difference, and he said that the machine that does a pry-top is less expensive but the twist-off is preferred by newcomers to the craft market. Things may have changed since then (I saw a note in 2012 that the brewery was going to pry-tops), and there’s a preference among craft brewers for pry-tops, something I notice in a New World or Crispin, but among larger manufacturers for twist-offs, which I see in an Angry Orchard, RedBridge or most Woodchucks (some of their smaller crafts are pry-top). I wonder if that’s a market signal of quality, ie that twist-offs are mass market while pry-tops are premium? JT: 6 at once! That’s impressive. Yeah, I read somewhere that a beer stays fresh longer with a pry-off top, but I find it hard to believe that it would make much of a difference. Maybe it’s more about image. The cheaper machinery makes sense too. Finally, I found another person just like me. We no longer have to hide in shame. Twist bottle cap inept people, unite! A kindred spirit! That’s good to know. Thanks Allen! Have you tried letting out a big roar as you twist, like you’ve just dunked a basketball over Dwight Howard with authority and you simply cannot contain the thunder within? I imagine that would give you a surge of power akin to a can of processed spinach for Popeye. Trev: That method worked back when I got over my fear of roller coasters, so it’s certainly worth a try here. I really need to incorporate roars into more things–they seem to be very helpful for athletes. Confession: I have no grip. I consider myself to be a fairly strong person, but I have always had an extremely difficult time opening pretty much anything (think anything from opening a beer bottle to peeling off the sealed top of a new bottle of ketchup, peanut butter jar, etc). Worthless. Also, I don’t know if I’m too late for this, but I DO NOT recommend trying to twist off beer caps with your bicep skin. It’s at least 5 times as painful as it looks, and I’ve never been able to actually make it work. Instead, I recommend using a bottle opener and then claiming ignorance when you “realize” it was a screw cap. Lindsay: I appreciate you sharing that confession–you’re in good company here. I like your strategy of feigning ignorance on the screw caps.